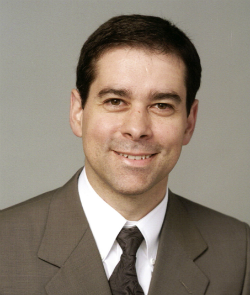 Pedro Avila, MD, professor in Medicine-Allergy-Immunology and principal author of the paper, studied airway response to virus infections in asthmatic and healthy control cells. Changes to DNA may explain why the cold virus makes asthma symptoms worse, according to a recent Northwestern Medicine study. Specifically, the scientists showed for the first time that the human rhinovirus infection—the most common cold virus—causes genetic changes in epithelial cells that line the nasal cavity. It happens through a process called DNA methylation, which decreases gene expression. “We thought DNA methylation could influence how epithelial cells respond to infections,” said Pedro Avila, MD, professor in Medicine-Allergy-Immunology. When most people get a cold, it affects the upper airway – the nose, sinuses and throat. But for many asthmatics, a cold spreads to the lower airway where it causes dangerous asthma exacerbations that can last weeks. “We have many ways to treat asthma chronically, but we don’t have good medications for the exacerbations caused by respiratory viruses,” said Dr. Avila. Postdoctoral fellow Peter McErlean, PhD, worked with Marcelo Soares, PhD, professor in Pediatrics-Cancer Biology and Epigenomics and his group to look at DNA methylation over the whole genome. They noticed that patterns did not match in asthmatic and healthy control epithelial cells. In addition, rhinovirus increased overall DNA methylation in cells from asthmatic patients. It meant that the virus might be shutting off some genes in the asthmatic cells. They confirmed by culturing and infecting cells in the lab with the virus, focusing on DNA methylation of a specific gene, SNORA12. They found that the asthmatics and control epithelial cells differed after infection and, surprisingly, at baseline. The study was published in BMC Medical Genomics. In addition, once scientists know more about the specific genes that participate in virus response, they might be able to target them for therapy to cut back asthma severity during a cold. This work complements a study by Dr. Avila’s lab published earlier this year in Genome Medicine. It found that asthmatics with exacerbations induced by acute respiratory illness have a reduced but prolonged inflammatory immune response. Future research will focus on the specific pathways and genes that cause asthma exacerbations. Exploring these patterns may explain why some asthmatics experience exaggerated airway responses to virus infections, while others do not. The latest study was supported by the Glen and Wendy Miller Family Foundation, the Asthma and Allergy Foundation of America, the Ernest Bazley Fund and NIH grant U01AI082984.